Figure 1 Left: Thomas Midgley Jr. (1899-1944). 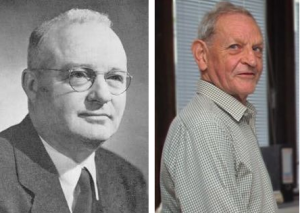 Right: Joe Farman (1930-2013). In the 1920s your fridge could kill you. A range of explosive, flammable and toxic refrigerants were in use at the time. So when Thomas Midgley Jr. (Figure 1) discovered a safe alternative, he was unsurprisingly lauded by the chemical industry. He called it Freon. It was a discovery that would change the world. Fast-forward fifty years and British scientists were taking measurements of ozone above their Antarctic base, Halley. This was among a suite of routine measurements that had been made for decades. No-one was expecting much change. However, it seemed that something strange had been happening in the springtime. 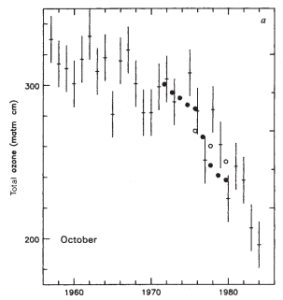 Since the late 1970s, the total amount of ozone had been going down. At least, the instrument said it had been going down. To Joe Farman (Figure 1), lead scientist, these readings seemed unlikely. In the twenty previous years of measurements they had never been so low. Farman questioned his tools. The instrument that measured ozone was old and perhaps unreliable in the harsh conditions of the Antarctic. He would replace it next year. Next year came and the new instrument gave the same low readings. However, Farman’s persistent doubts were borne out by measurements from a NASA satellite. Unlike Farman’s instrument, this continued to observe ‘normal’ amounts of ozone over the Antarctic in spring. He decided his team would take measurements elsewhere in Antarctica, perhaps something odd was happening above Halley Base. They measured 1000 miles away. The readings were still low. 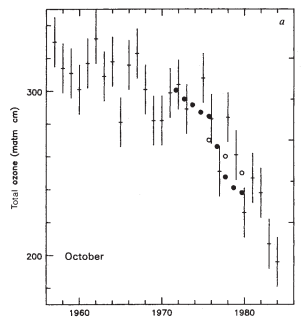 Figure 2 Farman’s springtime ozone measurements (1) from Halley base, Antarctica, published in Nature, 1985. In light of the mounting evidence, Farman published the work in 1985 (Figure 2). Around the same time, it was realised that the NASA satellite had been programmed to remove values that were ‘wrong’. Since such low ozone had never previously been observed or expected, NASA were discarding the measurements! When these discarded values were restored, it was realised that the ozone depletion extended over the whole of Antarctica. In Farman’s paper the authors identified inorganic chlorine as the likely reason behind the observed stratospheric ozone depletion (based on the work of Mario Molina and Frank “Sherry” Rowland a decade earlier – for which they would later win the Nobel prize). But where was this chlorine coming from? Midgley’s Freon – CFCs (chlorofluorocarbons). The problem with CFCs is that they were too perfect. A CFC leak poses no problems to human health because they don’t react with anything. They are inert – non-flammable and non-toxic. Midgley demonstrated this by inhaling the vapours from above a bowl of boiling Freon, and then blowing out a candle before astonished onlookers at a meeting of the American Chemical Society. Unfortunately, this means that when CFCs escape into the atmosphere, they hang about. They spread out around the globe. Only high-energy ultraviolet light can break them down. This light doesn’t reach the Earth’s surface, it is filtered out in the stratosphere by molecular oxygen (O2) and by the ozone layer. And so it’s only when CFCs reach the height of the ozone layer, that they are finally split apart, releasing extremely reactive chlorine atoms precisely where they will do the most damage. 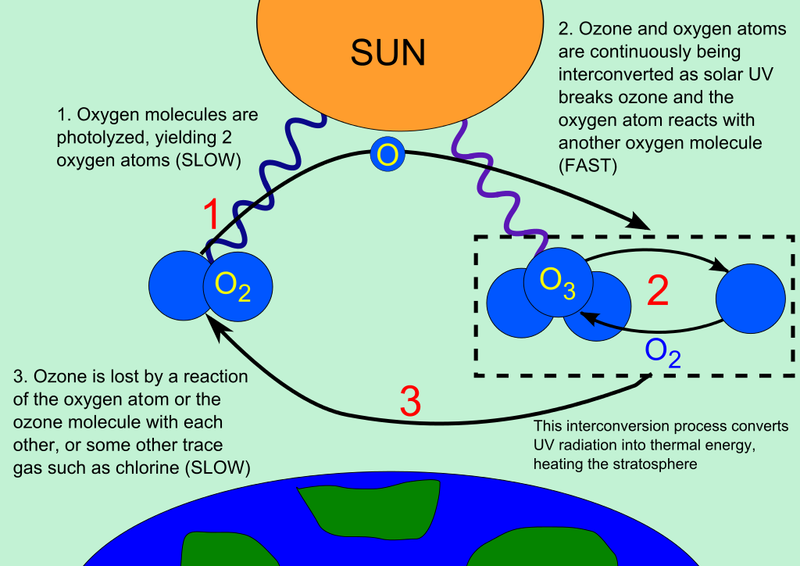 One chlorine atom has the potential to destroy tens of thousands of ozone molecules before it is removed from the stratosphere (2). However, despite this, ozone concentrations have only fallen by a few percent globally (Figure 3a). So why do they drop by over 60 percent in the Antarctic springtime (Figure 3b)? Figure 3 a. Global total ozone has changed by only a few percent between 1964 and 2010 (2). b. Total column ozone measurements (1986-2009 average) at South Pole show large ozone depletion in springtime (September-October) (3). Most of the chlorine atoms released into the stratosphere are quickly locked-up in ‘reservoir compounds’ that don’t react with ozone, such as ClONO2. These compounds act as a brake on the catalytic cycle of ozone destruction (Figure 4 – summer/autumn). However, in the unique conditions of the Antarctic stratosphere in winter, that brake is removed. During the winter, a boundary forms in the atmosphere isolating the Antarctic from the outside world, the polar vortex. This will define the shape of the ozone hole. In the extreme cold, nitric acid (HNO3) freezes. Clouds of nitric acid particles form. Through the winter these particles grow and eventually sink out of the stratosphere due to gravity (Figure 4 – winter). This removes the nitrogen required for forming ClONO2. But there is no ozone loss yet. That requires light. By the end of the long winter night, almost all of the chlorine is present as (harmless) Cl2. When the sun rises, this Cl2 is split into two chlorine atoms, kicking off the ozone destruction. With no NO2 to form ClONO2, the brakes are off. The chlorine alternates rapidly between Cl and ClO, in a catalytic cycle in which ozone is the fuel (Figure 4 – spring). During the months of September and October, this process consumes much of the Antarctic ozone layer, leading to the infamous ‘ozone hole’. But with the breakdown of the vortex during the late spring and summer, nitrogen is replenished, mixed in from outside, and ozone concentrations return to normal. Figure 4 During autumn most of the ClO reacts with NO2 to form the reservoir compound, ClONO2. In winter, nitrogen is removed when nitric acid clouds sink out of the stratosphere. After sunrise, ClO reacts with itself in a catalytic cycle leading to rapid ozone destruction. Within two years of the publication of Farman’s landmark work, a multi-lateral agreement, the Montreal Protocol, was in place to reduce the use of CFCs. Their use, and that of many other ozone depleting gases, is now banned globally. CFC concentrations are beginning to fall; the ozone layer is beginning to recover. Concentrations in the Antarctic, and globally, are predicted to return to 1980 levels by the middle of this century (2). And Thomas Midgley? He is remembered as just another eccentric inventor whose creations trod the knife-edge between panacea and poison. 3 Adapted from http://www.noaanews.noaa.gov/stories2011/20111020_ozone.html, accessed 17th August 2015. 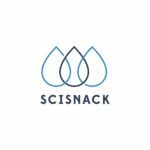 I am a post-doc at the University of East Anglia exploring the chemistry that is going on around us in the atmosphere. I am currently focussed on oxidation mechanisms in the troposphere, and historical trends in atmospheric oxidants. Tagged Antarctica, atmosphere, CFC, Farman, Midgley, Ozone, ozone hole, pollution, Stratosphere. Unfortunately, I I’ve found this article only now, and I see no one has yet commented on the dubious statements made here. About the “clouds of nitric acid particles” in the stratosphere. These particles do not exist in the stratosphere in all, because nitrogen dioxide reacts with water vapor in the lower layer of the troposphere – this is a cause of “acid rains”. Chlorine could not stay long in the stratosphere, because its boiling point (-34oC) is higher than the stratosphere temperature (~-50oC), and chlorine molecules are much heavier than nitrogen and oxygen molecules. Moreover, there is a low probability of rising Cl2 up to the stratosphere. About Fig.3 in the article. Is it not surprising that in those places where CFCs are produced, the concentration of ozone decreases by only 5%, while in Antarctica in winter it falls by about 2.5 times? Is it easy for CFCs particles from Europe and North America to reach the stratosphere over Antarctica in spite of gravity? Please, note that during polar night, photolysis of CFCs with the formation of chlorine atoms (according to M.Molina and F.Rowland) is impossible. I will be happy if this comment stimulates the continuation of the discussion.